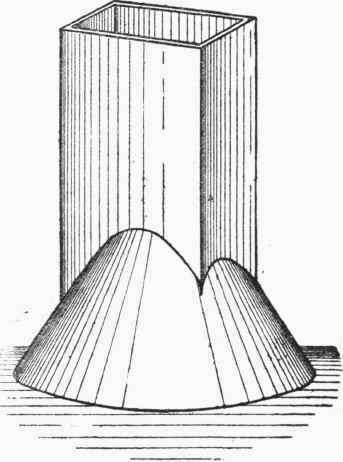 In several cases of ornamental and other work it may be necessary to joint together square, or rectangular, and conical pipes, as shown in Fig. 305. The pipes may fit concentrically (which means having a common centre line) or their centre lines may not coincide, but be parallel. In either case, the method of laying out the pattern-shapes will be the same; but as the former will require a less number of lines than the latter, we will show the setting out in connection with that one. 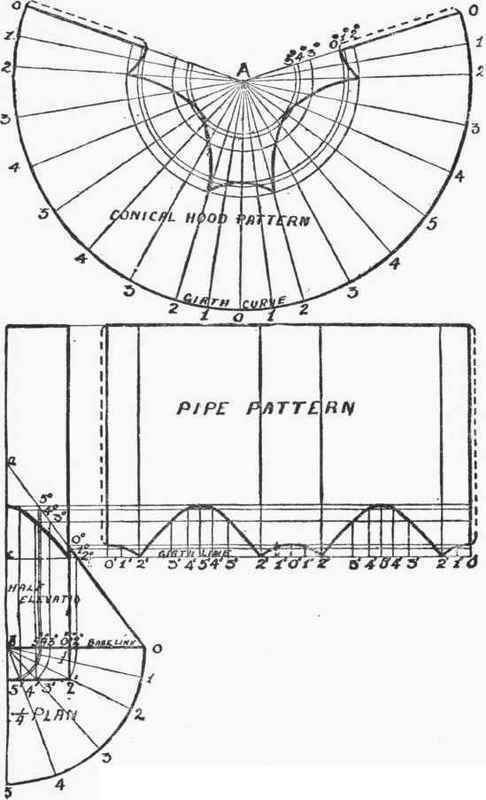 The drawing of the patterns, both for the rectangular and conical pipes, is shown in Fig. 306. A quarter-plan and half-elevation is first drawn. The point b is joined to 2', and produced outwards to 2; the arc 2 0 then being divided into two equal parts and the arc 2 5 into three equal parts. The division points, 1, 2, 3, etc., are then joined to 6, thus fixing the points 1', 2', 3', etc. Taking 0 as centre, and b 5', b 4', etc., respectively, as radii, the points 5', 4', etc., are turned on to the base line, thus giving the points 5", 4", etc. Perpendiculars are then run up from the latter points to meet the outside lines of the curve in 0°, 1°, 2°, etc. A girth line is then laid out for the rectangular pipe pattern by marking the distances 0' 1', 1' 2', 2' 3', etc., as taken from the same numbered line in the plan. Perpendiculars are next run up from the girth line division points, and these cut off by projecting along the required heights from the elevation. That is, a line is drawn along through 5° to cut off all the perpendiculars drawn up through the points marked 5' on the girth line; the same for 4°, and so on for each number. (In practice it will be better to mark out the pipe pattern away from the elevation, the heights for these lines then being measured from the line c 2° up to the respective points.) The points as found are then joined up, and the rectangular pipe pattern is complete. The pattern for the conical part can be struck out by first setting the compasses to a 0 as radius, and describing the pattern circle. The length of the girth curve can be measured out by making the respective lengths the same as those with the similar number on the quarter-plan. The division points of the girth curve are then all joined up to the centre, A. To mark off the points on the radial lines, to form the cut, the compares are opened out to a 5°, a 4°, etc., on the elevation, and these distances used to mark around the arcs on the pattern. Thus, A 5° on the pattern equals a 5° on the elevation, and so on for the other lengths. Where these arcs cut the correspondingly numbered radial lines will give points on the pattern cut as shown. These being joined up with an even curve will complete the pattern. Any allowance for laps can be added according to the method of jointing adopted.